❤Only support 2G GSM micro sim card with data and voice plan. Not support CDMA sim card.GSM quad- band: 850/900/1800/1900MHz . ❤Daily waterproof-Please take off watch when taking shower or hot springs etc,It is not a big problem when kids washing hands or running in the rain. ❤We provide 30-Day Money-Back Guarantee for Any Reason, 12-Month Warranty for Quality-Related Issues. - GSM quad- band: 850/900/1800/1900MHz . - Expandable storage (MicroSD card): Up to 32GB. ✔Quick dial-Designed for Preschooler--double click icon:mom/dad/SOS on the home screen,a quick phone call can be made. ✔Learning games: 2048, the classic square, schulte grid. ✔Scene mode: standard ,silent ,conference, outdoor. 1 * Kids smart watch (not include Mirco sim card) . a. SpeedTalk Mobile Card which has a $5 plan. b. T-Mobile Prepaid Complete SIM Starter Kit SIM Card. ❤★FASHIONABLE SMART WATCH PHONE: Built-in 1.54"IPS full-colorful touch screen and Build-in 30 million pixels of front-facing camera helps your baby to take selfies and pictures that they'll want to show off,that is all recording their pure and colorful childhood. 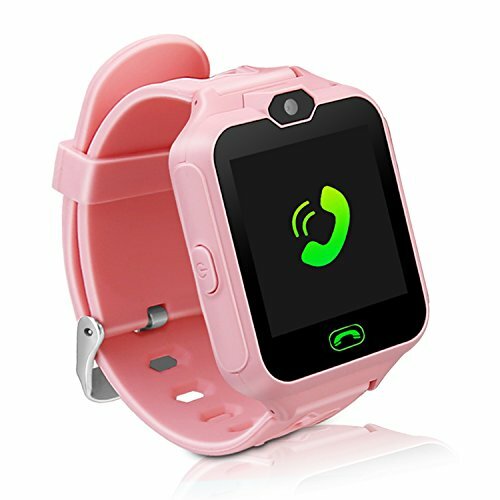 ❤★TWO WAY CALLS & QUICK DIAL: Kids Smartwatch worked as Unlocked 2G GSM helps you to reach your child anytime anywhere.More importantly,when in distress ,only press SOS Key for 3 seconds in any model,it will call 3 phone numbers alternatively in 2 rounds until answering the call, for the full safety of your child. ❤★MULTIFUNCTION SMART PHONE WATCH: In addition to alarm,timer and stopwatch,kids smart watch also has:3 kinds funny puzzle games,Audio player,Calendar,Calculator,Record,Low-power Alarm,etc.It is a great gift for every child to enjoy entertainment and learning. ❤★LONG STANDBY & DAILY WATERPROOF: 380mAh lithium polymer battery,120hours standby time,7hours talk time on 2G network.Even more the water protection grade up to IPX65(water resistance 5M)prevent water and dust effectively. ❤★GREEN MATERIAL & LOW RADITION:Food grade silicon of strap ,prevent scratch design of watch case and extreme lightweight(34.8g),all-round protection child wrist safety ,more comfortable and even more durable. If you have any questions about this product by MIMLI, contact us by completing and submitting the form below. If you are looking for a specif part number, please include it with your message.